Last year, Pebble introduced built-in activity tracking as the foundation of our new Health app. But health is so much more than steps and sleep. For the past several months, we’ve been brainstorming about what’s next for Pebble Health. I’d like to share with you the results of our first internal experiment: The Happiness App. Our motivation behind this project was to understand how our mood and energy levels fluctuated throughout the day. Was there a natural pattern or weekly cadence? Could we visualize our personalities based on these fluctuations? We also wanted to know how different environments, interactions, and activities impacted how we felt. Were we happiest with friends, colleagues, or family? Did we feel run-down during our daily commute? Did drinking coffee, water, or alcohol have a noticeable impact on our emotional stability? The magic of color watchfaces. The app runs for a week and prompts you every hour or so (during waking hours only, thankfully). We expected that for some testers, these frequent interventions would be too annoying. While that was certainly true in a few cases, the majority were invested enough to stick it out the full week. We even had a couple testers who got so attached to the app that they re-enrolled for another weeklong term! We found that the app delivered value to testers simply by providing them with a moment to check in on how they were feeling and what they were doing. In essence, the app supplied a call to action — it asked testers to pay attention to their emotional landscapes, and to stay aware of the various activities that can impact their mood. We also noticed that the app’s prompts subtly encouraged testers to adopt new behaviors. One tester realized that he was always saying “no” when the prompt asked if he drank water in the last hour, so he resolved to drink more water. Another took up yoga thanks to a recurring yoga-related question. Since the study only ran for a week, these changes are not likely to stick for a lifetime, but it is encouraging to note that subtle suggestions really can inspire healthier habits. Yes, he sees a complete crash in mood before lunch! His pre-dinner slump is not as bad, but eating dinner gets him back to gleeful levels of good feeling. If only more of the world’s problems could be solved with a granola bar. Road rage in graph form. Disclaimer: I was really annoyed leaving the gym one day during the test — I’m pretty sure I don’t just hate exercise? 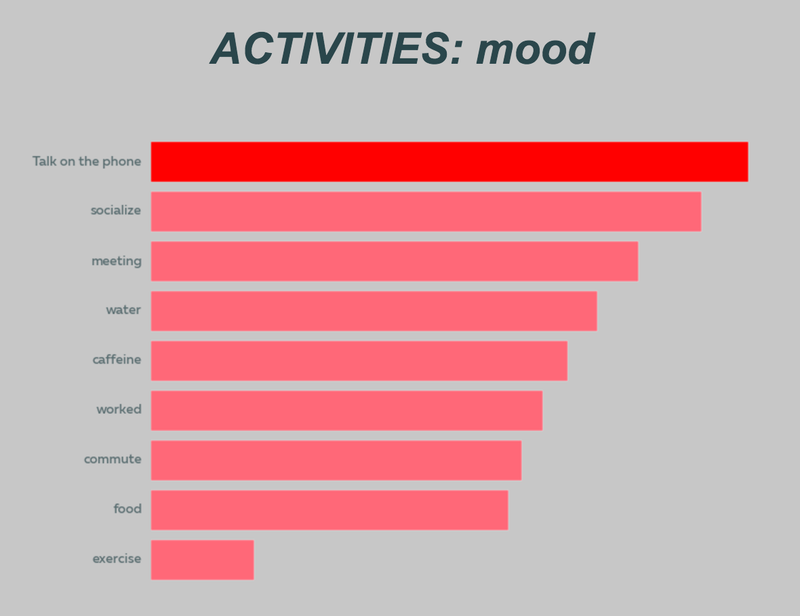 I was surprised that social activities tended to precede my good mood: whether that was talking on the phone, chatting with a colleague, or even attending a meeting (especially since, in the aggregated data, attending meetings had the most negative impact on mood for our testers!). I’m now much more inclined to give myself a few minutes to say hi to folks around the office, since I can see it makes my day better. This is just a taste of the kinds of insights the app delivered — for the full story, go try it for yourself! Overall, our testers found the experience interesting and insightful (and some of the results are utterly hilarious, especially if you can compare with friends). We hope you’ll try out the app and let us know what you think! Insights from Pebble’s research community.